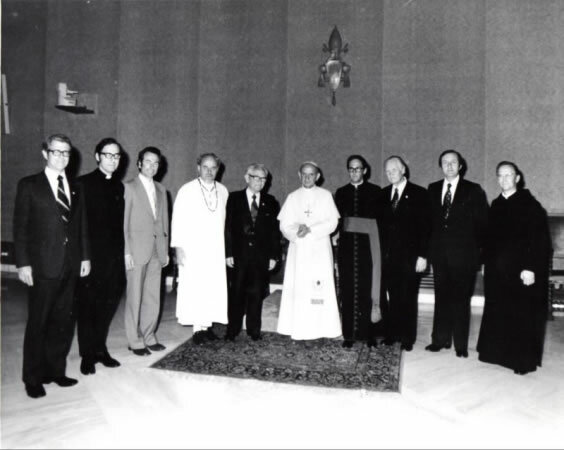 11- Participants in a Roman Catholic/Pentecostal Dialogue, held yearly (1977-1982). The restoration of unity among all Christians was one of the principle concerns of the Second Vatican Council, and, in the years that followed the Council, the Catholic Church set up dialogue meetings with representatives from various Christian communions. One of the earliest was a dialogue of selected representatives of Roman Catholics and Pentecostals. The Dialogue participants alternated the sites for the dialogues at a Catholic location one year and a Pentecostal one the next. Because there were no Classical Pentecostal theologians beyond one in South Africa, Charismatic Protestant denominational theologians were a large part of the planning sessions and the first few years of the dialogues. Later, Classical Pentecostals entered in and wanted the future dialogues to be strictly between Roman Catholics and Classical Pentecostals. Participants in one of the early sessions of the dialogues pictured with Pope Paul VI are from left to right: J. Rodman Williams-Presbyterian theologian; Michael Harper, Anglican priest and theologian from England; Arnold Bittlinger, German Lutheran theologian; Father Pierre Duprey, representing the Vatican's Secretariat for Promoting Christian Unity; David du Plessis, independent Pentecostal minister, considered one of the main founders of the Charismatic Movement; Pope Paul VI, Monsignor Basil Meeking, also representing the Vatican's Secretariat for Promoting Christian Unity; Justus du Plessis, leader in the Pentecostal Faith Mission in South Africa; Robert McAllister, prominent Pentecostal missionary in Brazil; Kilian McDonnell, Benedictine scholar and co-moderator of the Dialogue with David du Plessis.